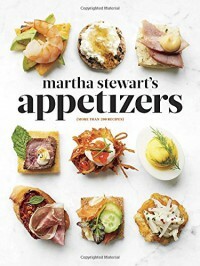 Martha Stewart’s Appetizers is a wonderful and priceless addition to my bookshelf. Starting with the fabulous cover and back cover photographs, they are absolutely perfect for this book. The appetizers in those photographs are mouthwatering and definitely make you want to open the book and read it. The orange spine cover is perfect for any bookshelf. You won’t miss the title of the book on your shelf. This book has it all: a Foreword by Living’s royal highness Martha Stewart of course, her 10 GOLDEN rules for Hosting a party, her tips and strategies for party planning and for the basic serving essentials you should have to make your appetizers look spectacular, 200 recipes for Snacks, Starters, Small Plates, Stylish Bites and Sips plus a final chapter with Basic Recipes and Techniques for roasting, toasting, blanching, peeling, and other essential skills. Martha should add a warning that the objects in the photographs are not as real as they appear! The photographs are so visually enthralling that you want to grab the appetizers from the photographs and eat them.